Akbar Travel has selected global technology company, Sabre Corporation, to enhance its online customer experience offering, drive operational efficiencies and support its global growth, which will see the Middle East agency expand into new markets across GCC. Akbar Travel will also invest in new technology such as mobile, online, data and automation capabilities to provide clients with a more personalized travel experience. 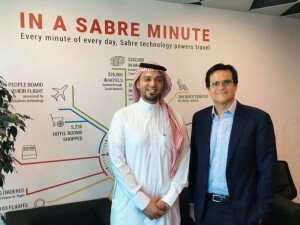 “Akbar Travel has a clear growth strategy, and their roadmap to use the latest technologies to create a more personalised travel experience aligns completely with the investments Sabre is making in data, merchandising and mobile technology to help agents deliver a more seamless traveler experience,” said Ramzi Al Qassab, commercial director for GCC and global partners, Sabre Travel Network Middle East. “Sabre’s global expertise, extensive knowledge and understanding of the dynamic global travel ecosystem helped us take the right steps when expanding in the region. Their team’s extensive industry network across all GCC countries and their accessibility has been valuable in supporting our strategic roadmap for this vital travel region across the Middle East,” said K.V. Abdul Nazar, founder and chairman of Akbar Travel.